For the prevention of risks rising day by day,Road safety regulations are more strict to reduce mortality,Transport Minister Mahender Reddy said Be sure to follow and Avoid the dangers.On Monday, under the auspices of Sri Krishna Youth Association of Hyderabad,Helmets were distributed to youth.25-35-year-old yoth are in high risk of road accidents. Expressing disappointment, speed, alcohol driving and driving, and violating road safety regulations, they lost their lives.About 1.56 lakh people are killed every year in the country, killing 7,000 people every year with 20,000 accidents.The state of Telangana in the prevention of dangers has been called in the country as early as 2020 by 50% accidents.All the groups have called for cooperating with the risk of non-threatening Telangana. 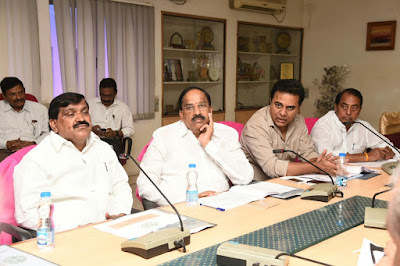 Minister Mahender Reddy suggested that the road safety regulations should be adhered to for the prevention of famine.He said the terms of the abroad are more severe.The Cabinet sub-committee meeting with ministers Thumala Nageshwar Rao, KTR, Indrakaran Reddy and DGP Mahender Reddy discussed the issue on the road safety issue.The Department of Transport will work together with education, medicine, R & B, PR and others to prevent accidents.In addition to enhancing the roads, expansion and speed control centers, the Minister also explained that road safety will increase the awareness of the students.